Monkey see, monkey can’t always do. I know I can’t sew. I’ve tried it several times before and always end up frustrated with an equally frustrated product. But my daughter, this time around; and my mother in the past, somehow have convinced me to try again. Now, I just want to make some curtains. How hard can it be? Sew a line here and sew a line there. But that must of been too easy because I made it back to the cutting board to make a bag for my sewing machine of all things. This was a weekend project. Day 1-get robbed at the fabric store. Start on the project, get angry, rip it out and go to bed. Day 2 wake up early to find out the project you were to finished is finished. So what can I do, iron fabric and trim. No sewing allowed. 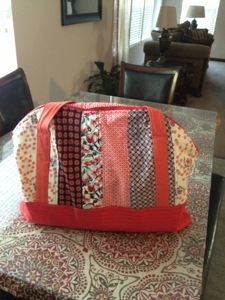 Day 3 my bag is finished. I did get to design one panel and pin the interior. It was fun spending time with my daughter. I don’t know how she didn’t see I don’t like sewing. She’s already planning for us to make a clutch together. Her and my daughter-in-law made one in an hour. 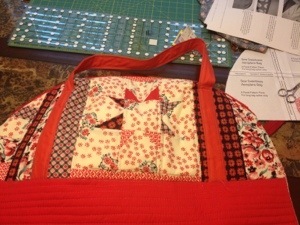 I don’t need another sewed bag. I’m fine with Coach doing the sewing. Thanks Kare and Audrey. Next time I will make lunch. I like your honesty. Do what YOU do best. Leave the sewing to your daughter. Thanks. Unfortunately, failure is not an option! The things we do for our kids! What a good sport you are! I laughed out loud at your line about making lunch next time. Thanks for sharing! Thanks for reading. I know I can do food!